BEIJING: China has tightened regulations governing forced land expropriations in a bid to put a lid on what has become an explosive social issue and one of the country's biggest sources of unrest. Authorities have for years tried to address the issue of government-backed “land grabs,” which regularly trigger protests as residents complain of poor compensation for homes that have been demolished to make way for new buildings. In January 2011, new rules were issued stipulating among other things that violence cannot be used to force homeowners to leave and that compensation must not be lower than the market price, but these regulations are often flouted. Under the tightened rules, government authorities that want to expropriate land but cannot reach an agreement with residents and apply to a local court for approval, must provide additional documents to prove their case. These include a “social stability risk assessment” as well as “feedback from homeowners and the party which enjoys the direct benefits” from the land expropriation. In addition, the amended rules which came into force yesterday lay out a series of reasons for local courts to reject authorities' applications for land expropriations. China faces increasing pressure from public discontent over forced and illegal land grabs, which have in the past few months sparked protests against authorities in various areas. Last week hundreds of ethnic Mongols living in the northern region of Inner Mongolia tried to stop a vehicle belonging to a forestry firm that they claim had illegally occupied their land. Authorities arrested 22 people amid accusations of police brutality, rights groups said. 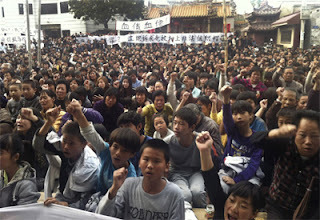 Land grabs also triggered a huge revolt against authorities in the southern village of Wukan in December, in a case that attracted international media attention and eventually led to rare concessions by the provincial government.